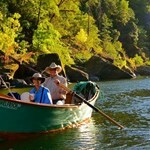 Floating and fishing the "Wild and Scenic" Rogue River Canyon is considered one of the Pacific Northwest's most spectacular river experiences. Enjoy this stunning canyon from the classy comfortable ride of a beautiful wooden drift boat and spend your evenings in unique riverside lodges. 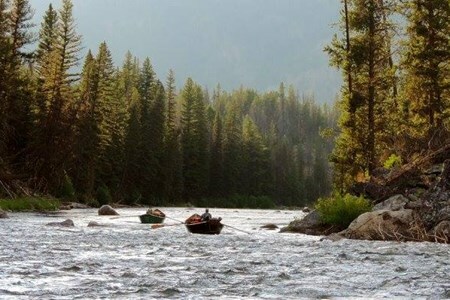 Spend four days floating the 43 miles of protected waters while fly fishing for half-pounder and adult steelhead fresh out of the ocean. 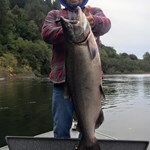 Legendary for its combination of dramatic rapids and tranquil pools, fishing on the Rogue River has been popular with guests of the Helfrich family since 1931 when Prince Helfrich first explored the canyon. 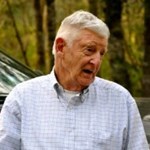 His legacy continues as newcomers enjoy the same majestic old-growth forests of Douglas fir and twisted Madrone along the riverbanks. Picturesque grassy pastures, wildflowers and wildlife are all part of this unspoiled wilderness. Deer, otter, black bear, blue herons, osprey and bald eagles call this paradise home. And then, there are the fish! With two fishermen and one guide in each drift boat, you’ll have a unique opportunity to catch fall run Steelhead and Salmon on lures and flies. Even the most experienced fishermen will be challenged by the great sport of landing these fighters on light tackle. 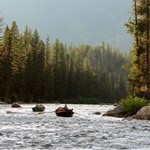 This is a world-class fishing river and our guides serve as skilled fishing instructors and experienced boatmen. 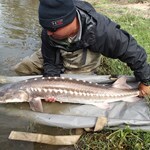 Their knowledge of the river and the maneuverability of the drift boats allow them to easily access the placid pools and rich holes where the fishing is best. 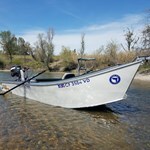 Our trips begin at Argo Riffle and for four days and 43 miles we will travel west in McKenzie River drift boats through the Coastal Range to Hog Eddie at Agness. You’ll get a firsthand look at Rainie Falls, Zane Grey’s cabin, Mule Creek Canyon and Blossom Bar rapid. Each night you will enjoy the comfort of three different rustic wilderness lodges. Shore lunch stops along the river allow time to relax and explore the area. 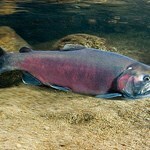 We often barbecue or pan-fry any freshly caught steelhead or salmon. Delicious! No one goes away hungry. 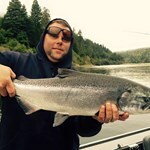 The combination of unforgettable fishing experiences and drift boating through exciting whitewater make this outing on the Rogue River's "Wild and Scenic" section Helfrich River Outfitter's most sought after and desired fishing adventures. 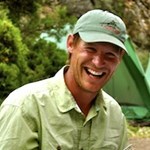 Nights are spent in comfortable wilderness lodges with private sleeping accommodations for couples or singles. 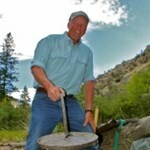 All of the breakfasts and dinners are served family-style by the guides and lodge staff. Each remote lodge offers its own distinct character, which adds a memorable element to the trip that few ever experience, as they are only accessible by river or hiking trail and are run on generator power. 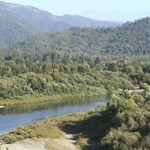 The Rogue River begins near Crater Lake and flows 215 miles through the mountains and valleys of southwest Oregon emptying into the Pacific Ocean at the town of Gold Beach. Rushing ... morefrom the Cascade Range, the river glides into the Rogue Valley floor, drifting peacefully past cities and towns and agricultural lands. 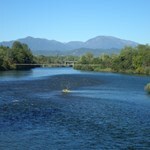 The Wild and Scenic River designation begins west of the city of Grants Pass where the Applegate River flows into the Rogue River. 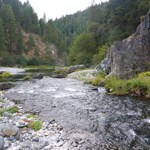 The river turns north, flowing through the scenic Hellgate Canyon, and then bends sharply west at Grave Creek, where the Wild Section of the Rogue River begins. Here the powerful river cuts through the rugged terrain of the northern edge of the Klamath Mountains. The river churns through the steep rock walls of Mule Creek Canyon and the boulder-strewn Blossom Bar Rapids before slowing in Huggins Canyon and Clayhill Stillwater. Below the town of Agness, the Rogue and Illinois Rivers join and flow through picturesque Copper Canyon. Below Copper Canyon, the river widens and slows, with the Wild and Scenic designation ending where Lobster Creek enters the Rogue River. 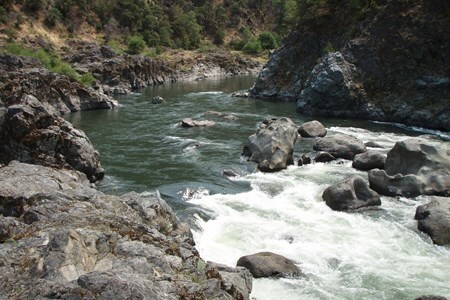 Flowing through time, the Rogue River has nurtured those who have come to its lush banks. 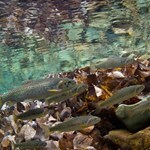 The earliest inhabitants were Indians who lived a life of hunting, fishing, and gathering. Various Indian tribes made their homes and found sustenance along the Rogue River for over 9,000 years before Euro-Americans arrived. In the 1850s, miners poured into the Rogue Valley and Indians awoke to the coarse cry of “Gold!” which, with startling immediacy, signaled an end to a way of life Indians had known for thousands of years. 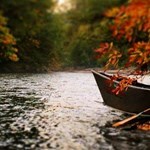 The boatmen of the early- to mid-1900s, whose daring and perseverance established dominance over the wild waters of the river, were responsible for opening these waters to the guide-fishing industry and whitewater boating that has become so economically vital to southwest Oregon today. 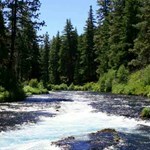 The Rogue River was one of the original eight rivers included in the Wild and Scenic Rivers Act. 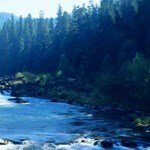 With its famous steelhead and salmon fishing, challenging whitewater, and extraordinary wildlife-viewing opportunities, the Rogue River continues to be one of the world’s most popular recreation destinations. 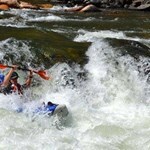 The 34-mile Wild section features predominantly Class III (or less) rapids, and includes thundering Rainie Falls (Class V) and breathtaking rapids at Mule Creek Canyon (Class III) and Blossom Bar (Class IV). It’s fair to say that for anyone who enjoys the great outdoors, the city of Bend should be on your radar screen. 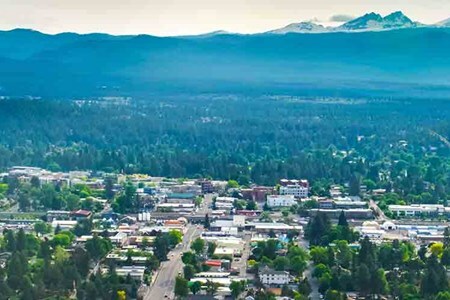 Once known as a logging town on the Deschutes River, it is now hailed ... moreas premier destination for anyone that likes mountain biking, hiking, skiing, camping, white-water rafting, horseback riding, paragliding, golfing and of course, fly fishing! Lumberjacks may now be hard to find here, but adventure tourists and outdoor sports lovers are in great abundance. One look at what the city has to offer and it’s easy to understand why Bend is a magnet for athletes and rugged sports enthusiasts. Among many other events, the city has hosted 2 USA Winter Triathlon National Championships, several national cycling competitions, 2 XTERRA National Trail Running Championships and is home to a men’s division 3 Rugby club, a women’s flat track team and a West Coast Collegiate Baseball team. Not far from town, is the 1.8 million-acre Deschutes National Forest that contains parts of 5 designated wilderness areas – Mount Jefferson, Mount Thielsen, Mount Washington, Three Sisters and Diamond Peak as well as six National Wild and Scenic Rivers. 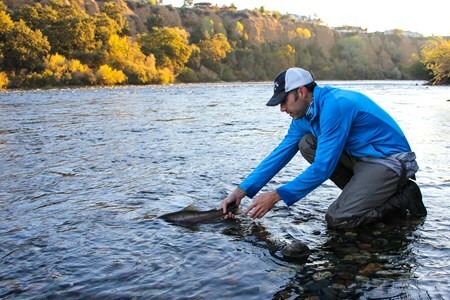 Great waters to trout fish near Bend include the Crooked River, the Fall River, the Metolius River and the Deschutes River that runs through town. 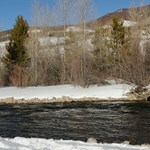 The town also boasts the Old Mill Casting Course, the first and only, 18 station fly casting course where anglers can hone their fishing skills. 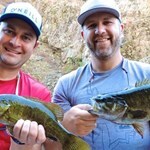 If you like to grab a cold one after fishing, Bend has over a dozen microbreweries and offers beer seekers bus tours, horse-drawn carriage tours and bike to beer trails. It even has a “find a beer” phone app. 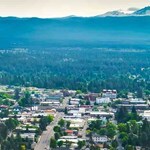 In keeping with other historical tourist towns, Bend has several museums, shopping areas, art galleries, live entertainment, and a wide range of restaurant and lodging choices. 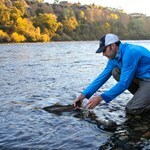 Payment directly with Rogue River Steelhead Fishing and Lodging with Helfrich River Outfitters.